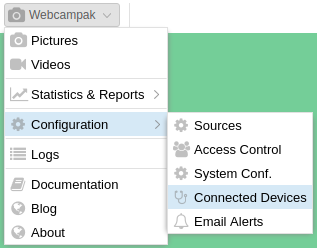 A screen listing connected USB devices can be accessed by clicking on "Webcampak > Configuration > Connected Devices"
This section lists cameras detected by gPhoto2, the library used to communicate with the camera. If your camera is not listed there, Webcampak cannot trigger captures. This section list camera features supported by gPhoto2. 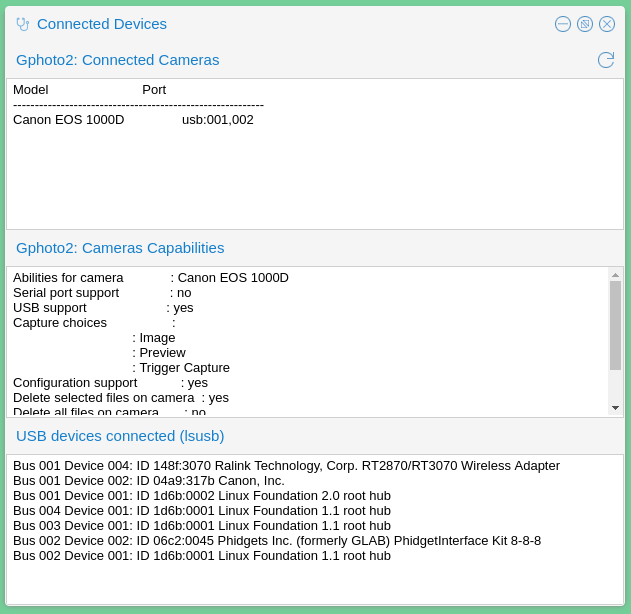 If a connected camera does not have any "Capture choices", it's likely that it is not supported for capture. This section list USB devices connected to the Webcampak. If a connected camera is not listed here, it is likely not powered-on. Bus 001 Device 002: ID 04a9:317b Canon, Inc.